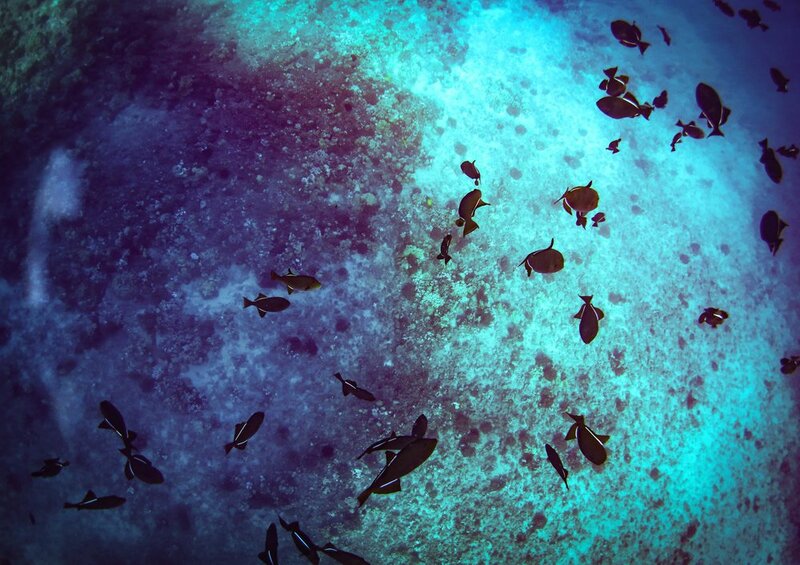 Good for seeing: Molokini is home to over 250 species of fish! Commonly sighted marine species include humuhumuele’ele (black durgeon), unicornfish, parrotfish, humhumunukunukuapua’a, whitespotted moray eels, octopus, lowfin chubs, Hawaiian spiny lobster, jacks, butterflyfish, and slate pencil urchins. Given Molokini’s pelagic location, however, nearly anything is possible, and manta rays, bottlenose dolphins, spinner dolphins, whale sharks, white tip reef sharks, and even humpback whales have been known to pay visits to the crater! Best time of year to snorkel at Molokini Crater: Due to its offshore location Molokini Crater offers amazing snorkeling during all seasons of the year. Reasons we might not snorkel here: Although unaffected by south swells in the same way the shoreline of Maui is, Molokini can often become too windy during the afternoon hours to snorkel (which is why all of the boats visit in the morning). Occasionally the tradewinds will blow from the north, which makes Molokini too rough and inaccessible for snorkeling. During this time we will choose another location such as Nahuna or Olowalu. For more information on Maui’s wind and weather patterns, see our related post “Understanding Maui’s Wind, Weather and Waves”. History: Molokini Crater has a lengthy history which ranges from a bombing range to a marine sanctuary. For more information, see our related post on the history of Molokini Crater. Trips offered to Molokini Crater: Our Discover Molokini tour sails to Molokini Crater 7 days a week, and it’s also the perfect place to try SNUBA!